Orb Audio's Mini 5.1 PLUS Home Theater Speaker System will blow your mind without blowing your budget. 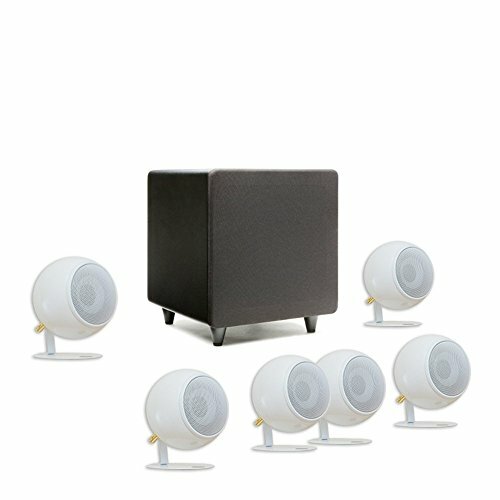 Available in 6 different finishes and an excellent speaker system for watching movies & TV as well as listening to all types of music, this surround sound system from Orb Audio features a Mod2X Center Channel Speaker, 4 Mod1X Satellite Speakers and the ultra compact subMINI powered subwoofer. Also included are the necessary wires and cables to quickly and easily connect the speakers and subwoofer to your AV receiver or amplifier. This system is modular and upgradeable by adding more locations for 7, 9 or 11 channel systems and by adding more Orbs to existing speakers for the higher-output Mod2X or Mod4X configurations. Orb Audio is known for designing systems which are able to produce big sound from small, attractive speakers, that rival the performance of speakers 2 to 3 times their size and price. The 5.1 Mini Plus Home Theater is no exception. Don't miss out on this remarkable offer! Audiophile sound, outstanding looks and a fantastic sale price - the Orb Audio Mini 5.1 PLUS Home Theater Speaker System has it all, so try it today! Compare to surround sound speaker systems which are twice as expensive. Top ranked surround sound system features Mod2X Center Channel Speaker enhancing dialogue and voice output with a significant boost to overall performance. Unique and handmade from steel, small speakers available in six finishes matching any decor. Fast, easy set up and award-winning Orb Audio customer service. Includes everything you need to connect the system to your receiver or amplifier, including a 12 feet premium subwoofer cable and 100 feet of USA made speaker wire. Wireless transmitter / receiver kit for subwoofer available. If you have any questions about this product by Orb Audio, contact us by completing and submitting the form below. If you are looking for a specif part number, please include it with your message.